Every once in a while I wander into the software/platform/apps realm for a post. I usually do so sparingly because this category of sports tech changes so quickly that any post I write quickly becomes out of date. That’s less so the case with new features (i.e. 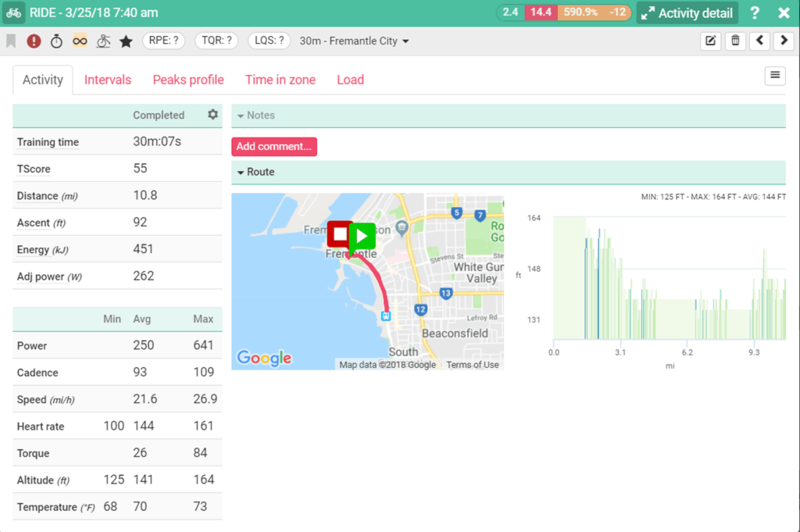 a new course on Zwift) as it is with training log platforms (such as Today’s Plan). A new course in Zwift is likely to more or less be the same a year from now, whereas training platforms change their user interfaces seemingly continuously. Still, for those that have been watching the endurance sports platform space, you’ll know there’s really only a handful of serious/major players. The biggest in the room is, of course, Training Peaks, which tracks a gazillion sports (and is personally what I’ve been using for more than a decade). However, in the last 2-3 years, we’ve seen some really compelling platforms come along. I profiled Xert last year, which is still cycling focused at this point. But Today’s Plan has really been the other biggie, which up until today has been cycling focused as well. That meant for runners or swimmers (and thus triathletes), that they were left with a non-complete picture of their training efforts. Finally, note that Today’s Plan is hardly new to the scene in cycling, where it’s used by Team Sky and Trek-Segafredo, as well as a few more that don’t officially note their usage. And Today’s Plan is also under the covers for Stage’s platform (though some portions Stages handles themselves). None of which means a pile of beans when it comes to swimming and running (except in the case of Froome perhaps). So let’s dig into things. So, I’m just going to dive right into it. Go big or go home. No futzing around with individual run sports or swimming and then building up to a multisport activity. Nope, I’m just gonna crack open an actual triathlon race from last month and see what happens. So, here we go – a race I’ve yet to write about – the Fremantle Triathlon. 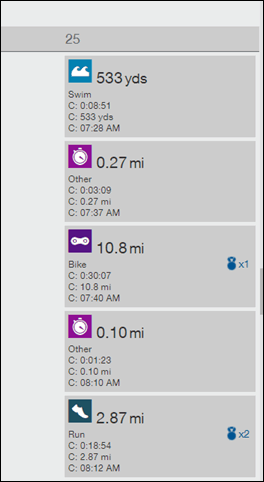 Of course, I should note that like most other platforms you can sync inbound from Garmin Connect or have it automatically upload from Wahoo devices too (and to/from Zwift). Both of those connectivity tidbits have worked for a long time. It can even upload weight scale data too (in fact, while I won’t touch on it here, their sensor-data driven pieces are among my favorite bits of the entire platform). You can also import your entire Training Peaks account in one shot. And I suspect once various entities finish getting their GDPR compliance in place before the end of next month, you’ll be able to do that for many other platforms too. In any event, my race. Here’s it imported into the platform with my calendar in the background. Above you can see the color-coded sections – blue for swim, grey for transition, yellow/orange for bike, and green for run. Each has the summary metrics you’d expect on the right, with the total activity metrics on the left. An overall map is viewable too. Nothing too unexpected here. For those curious, this was recorded on a Garmin FR935 (which is my current preference for racing and running). You’ll see my overall time/duration/distance and stroke rate. I didn’t use an HRM-TRI on this swim, so the heart rate value you see is the typical entry optical HR value that Garmin records before, not recording for the swim. 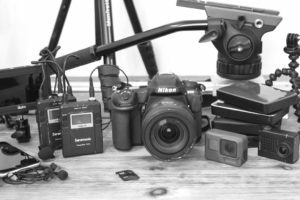 Why I didn’t use the HRM-TRI is a sad story of trying to swap out the battery with a butter knife the night before the race…a story for another time. 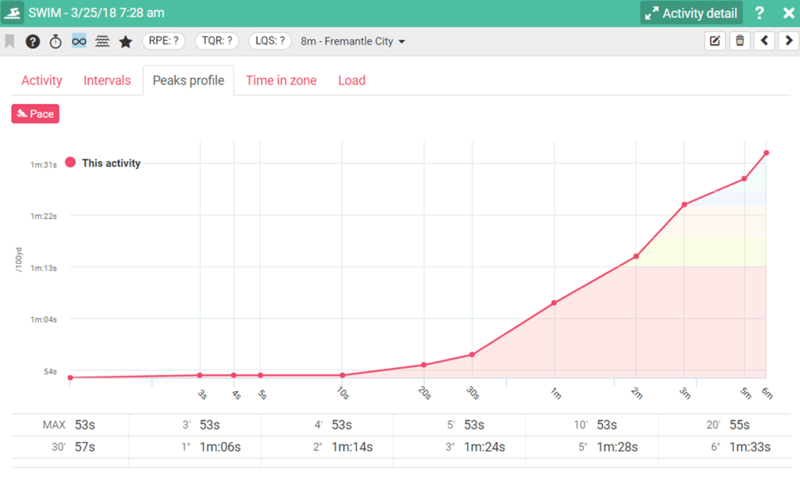 I can click on the Peaks Profile tab to get what is essentially a mean/max graph for time duration over pace. You can see some of my faster surges for shorter distances here. Given I only swam a handful of times prior to this race this year, I’ll take it…slow swim and all. I make it up on the run. I could also sort this by HR zone, but since I only have a single data point, we’ll save that tidbit for the bike. Speaking of which, let’s dive into the cycling portion now. Note that above I showed you the ‘preview’ style page for the workout, but I can also click to expand it into a much larger and more detailed view. First, the preview, then followed by the expanded view. You can see the activity detailed view where I’ve got splits/laps down below (which was automatically doing it at 5 miles). Otherwise, there’s the HR detail that you’d expect. Interestingly you can see the HR essentially craps out for a few minutes in the middle there. Additionally, you can see how the power was missing for the first 7 minutes. The power is missing because I totally forgot to pair the FR935 to the power meters on that specific bike. I had it paired to power meters on another bike for recent rides. So I did the pairing mid-race. That would impact things like my power curve chart, though not too much since like most triathletes I don’t tend to throw down big sprints in a non-drafting triathlon (draft-legal racing is different of course). Now, there are some slight oddities here. For example, in the activity preview/summary tab, I get a ‘Time in Zone’, but I don’t see that in the activity detail. I suspect there may be a setting/option to configure that – but it’s not super obvious. Whereas in the detailed view I get more metrics, like the Performance Index charts. In my case, I don’t have good long term data in here (I haven’t pulled in all my Training Peaks data yet), so the charts aren’t as vibrant as my training might be. Of course, you can also pull open load as well. Note that metrics like TSS/NP/IF are trademarked by Training Peaks, so you won’t get precisely those. Instead, you’ll get TScore/Weighted Power/IFF. Same concepts, different names. Similarly, when it comes to load metrics you’ve got CTL/ATL/TSB available too. At the top you’ll notice where I can specify a Perceived Effort ranking, same goes for ‘Total Quality Rated’ and ‘Leg Quality Score’ next to it. 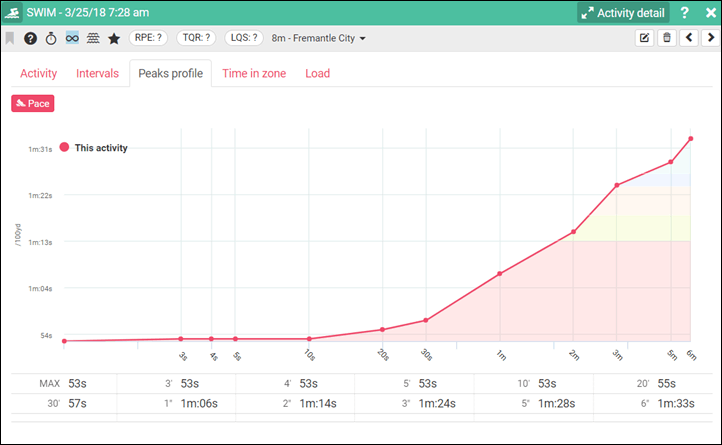 If we head back into the activity summary/preview page I can crack open the peaks profile to see my pace over time durations. Note, all of the metrics you see here are in Statute (aka minutes/mile, miles, Americana). For the most part, I’ve shown you the majority of tabs, though not necessarily how everything ties together from an analytics standpoint. Largely because I don’t have a ton of super consistent runs and swims in here to make those numbers sing (I’ve largely been cycling as of late, because I’ve mostly been working on cycling products lately). However, I did want to briefly call out the elevation graph, specifically the color-coding which correlates with the grade for the different sections. You can see I hovered over one section and the grade displays right there. Note this is from a different run. I’m a sucker for seeing just how steep something was in graphs, as often-times a simple elevation plot doesn’t really translate the short-term pain as well as being able to show someone (read: my coach) a 9% grade was involved. 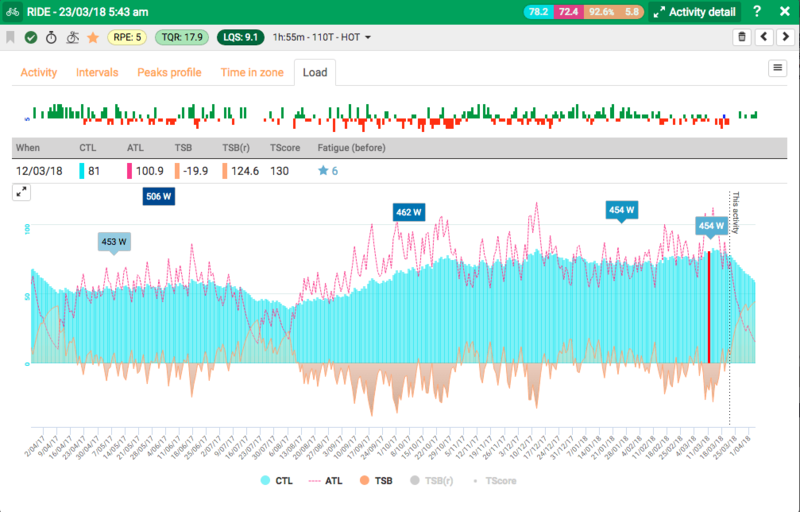 On the coaching front, the Today’s Plan platform was largely designed around an athlete/coach relationship – meaning that coaches have dashboards and such that allows them to see their athletes and all of these metrics (just as Training Peaks does). However, I’m not a coach, and my coach isn’t on Today’s Plan – so that’s something I’ll be skipping here. 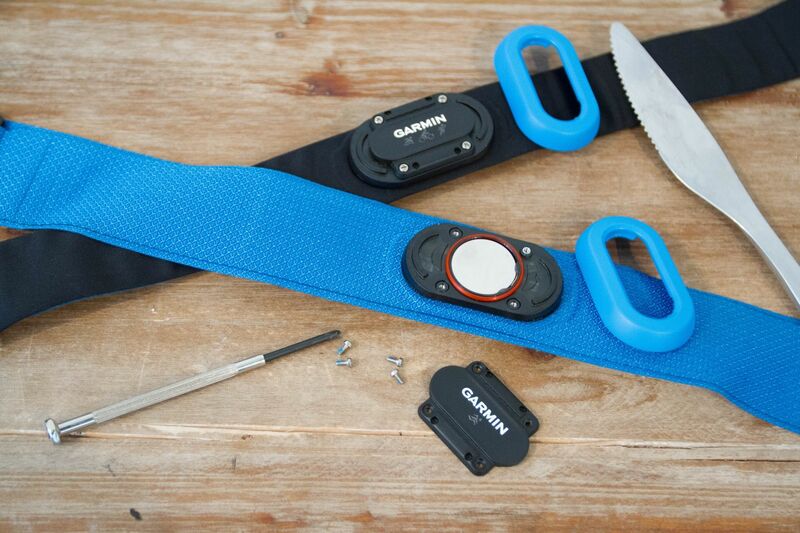 Now, only if Garmin would actually record the darn zero offset inside the files each time you do it. Something I’ve been begging for, for years. That would give coaches a fighting chance at knowing whether or not their athlete’s new record power values were real or likely just a bad power meter day. As a side note, since my account isn’t really as pretty as an athlete with a super structured training plan, it won’t show all of the metrics in their expected glory. As such, the Today’s Plan folks used screenshots to show me what that data looks like in a more structured setting. Below are those screenshots to get a better feel for things. Like many other platforms, Today’s Plan is rolling out Connect IQ apps. 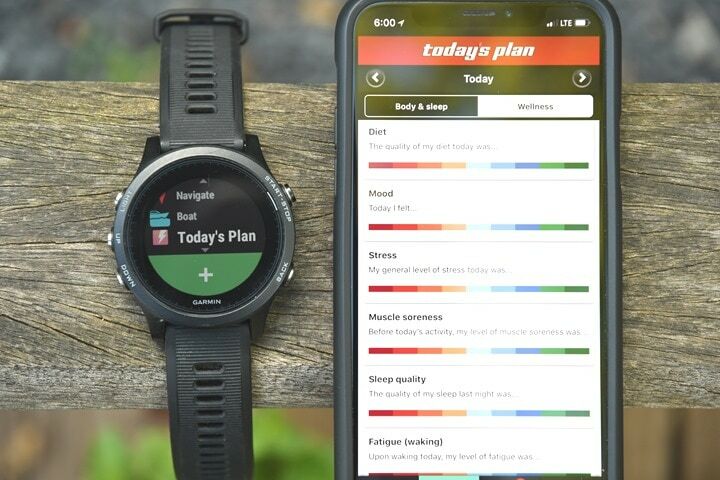 And like their competitors, the goal of Today’s Plan is mostly just to get your pre-planned/structured workouts from their platform to your device. Meaning, it’s just like the FedEx man, delivering your little workout page so that it can execute the workout just like any other workout. Once the app has completed the hand-off to the native workout piece, it removes itself from the equation. Except, there are some notable differences here compared to some of the other platforms, mainly in that it can actually record metrics too. 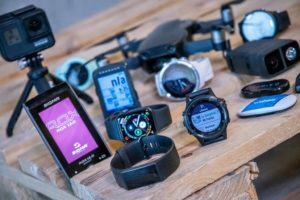 Next, it’ll require authentication via Garmin Connect Mobile. It only asks for this once, then it doesn’t ask for it again (in theory, on my beta version it does however). 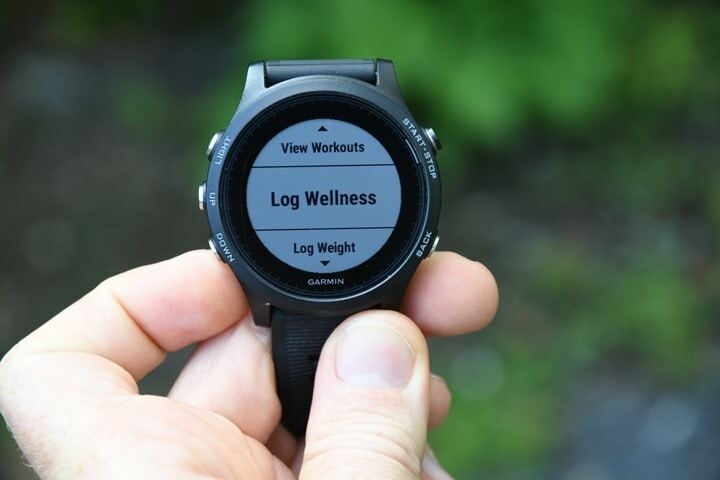 At this point you’ll see the option to ‘Sync Workouts’, ‘View Workouts’, ‘Log Wellness’, ‘Log Weight’, or Preferences. Sync workouts will just pull down the structured workouts that you have on your calendar to your device. Whereas viewing the workouts allows you to take a peek at them. Once a workout is synced to the device it’ll show up as an available workout via the normal Garmin menus, or you can execute it right away. What you see above is mostly how things work with respect to other platforms as well. What’s different though is the logging of ‘Wellness metrics’ and ‘Sleep’. These metrics include ‘Diet’, ‘Mood’, and ‘Stress’, ‘Muscle Soreness’, ‘Fatigue’, and ‘Sleep Quality’. All of which are shown on dashboards within the app that both you and your coach can see. That’s cool, and I think a valid use of the watch to get those metrics into their platform. It’s something that I could see you doing briefly after a run or workout while walking out a cool-down or similar. Or just in the elevator or something. The only challenge with these metrics is that given the lack of touchscreen, some of these can be somewhat cumbersome, versus something like an Apple Watch would make these a bit cleaner. One minor nuance to keep in mind is that Today’s Plan can’t remove workouts from your watch that have been deleted from your calendar. That’s because Garmin Connect IQ doesn’t have any method to allow an app to delete things like that, it’s a one-way entrance only. Thus, if you have a big shift in training, things could be messy on your watch for a bit of time. Not a huge deal, and applicable to Training Peaks too, but worthwhile noting. Now, as I mentioned before, these plans are somewhat limited…but they are at least free. 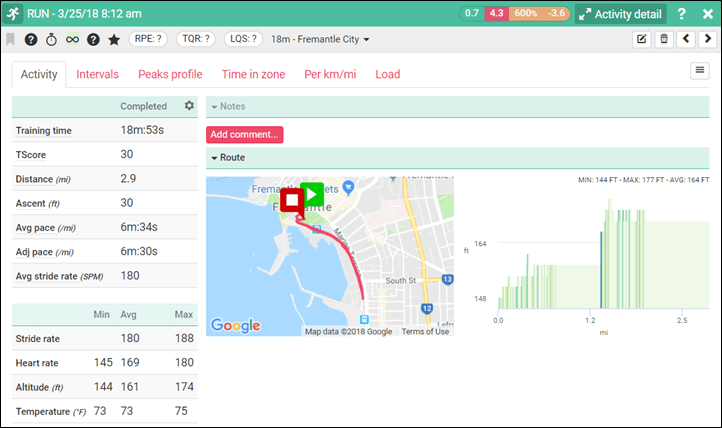 Which typically on Training Peaks or other platforms you’re looking at well over a $100 or more for a static training plan for an iron distance triathlon with this much detail. And in this case, you’ve got a fairly well respective coach behind it. Of course, I think there’s tremendous value in having a real-life coach, not so much because a coach tells you how precisely to workout, but actually when not to workout. Most endurance athletes tend to err on the side of overdoing it when it comes to training. Not recovering or tapering properly, or trying to train through being sick or injured. That’s where the value and insight of a coach can help re-arrange the larger schedule at hand to get you quickly on track. Still, everyone’s situations are different, so pre-canned plans can still be tremendously useful. With that, a quick (ok, it ended up being not so quick), look at the new features. 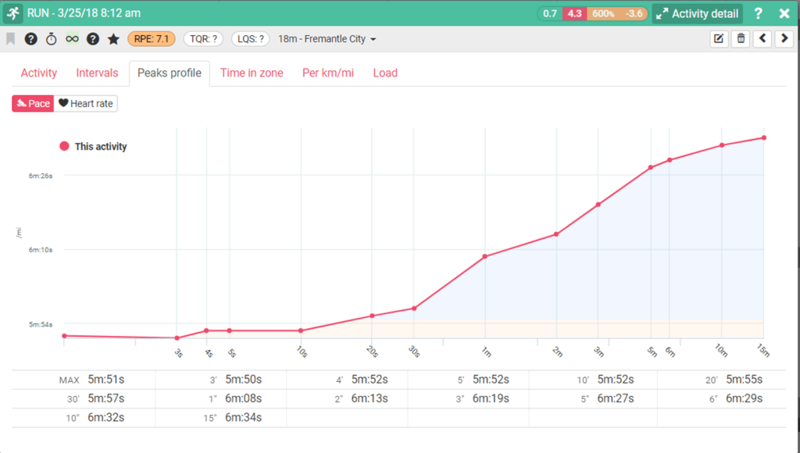 As I said at the beginning, I think Today’s Plan is by far the most viable competitor to Training Peaks. They’ve been pouring tremendous resources into new features that make it more and more competitive every day. Obviously they lack the number of coaches that Training Peaks has, which for many coached athletes is the single driver to a platform. In my case, when I first started with my current coach, he was (and still is), on Training Peaks, and thus that’s where I ended up. If I were a coach, I’d undoubtedly look to try out the various platforms and figure out the nuanced pitfalls of either platform and see which one works best. 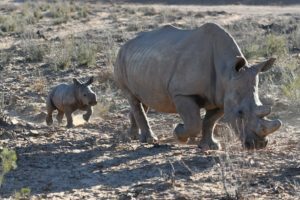 Of course, there are still other options out there – Final Surge being another that’s on the up and up recently. Which isn’t to say that I think all of the new platforms out there are great. In fact, a lot of them simply don’t hold a candle to the two TP’s (Training Peaks or Today’s Plan), nor to Xert and others. 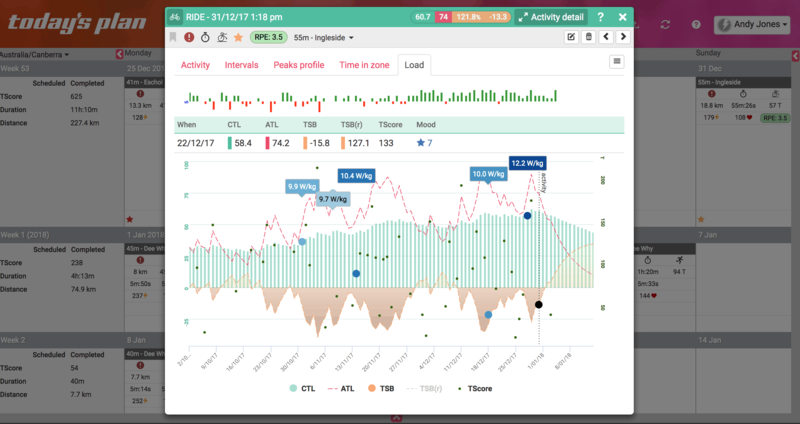 Far too many companies want to be in the platform business, but fail to understand that training log platforms are without a doubt the most complex entities in the entire software and hardware sports tech business. Everyone (especially coaches) has their 1% feature that if they don’t have they give up and move on to another platform. And as that feature name implies, it’s likely only important to 1% of coaches, but for that coach, it’s the most important thing in the world. 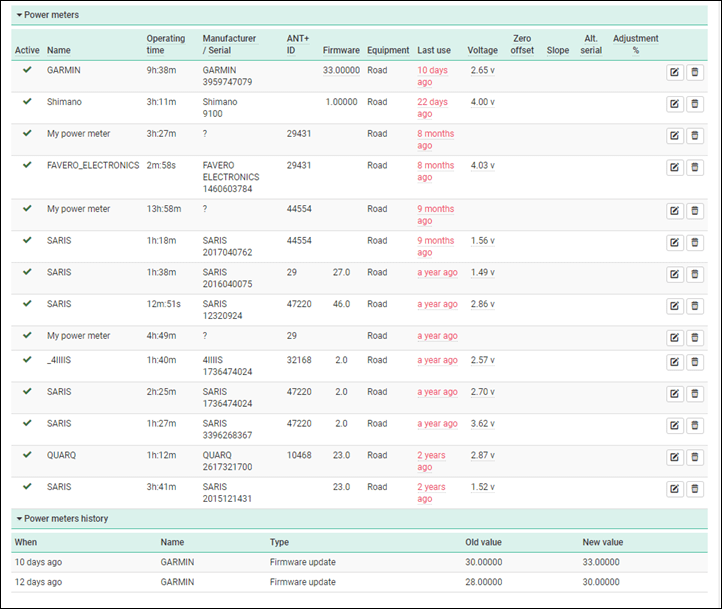 Training log platforms have to ultimately fulfill those requests, as they eventually add up to 100% of features. Quarters will not work on the HRM-TRI… you need a screwdriver, and, it seems, a knife. Just make sure to put the gasket in correctly. Mine started acting up a few weeks after battery change. It did dry out well, only killing the rusty battery. One of my biggest disappointments with Garmin and their training plans is that the swim workouts don’t make it to the watch. I was excited when I learned about Training Peaks connect IQ app only to find out that it too fell short when it came to swim workouts. 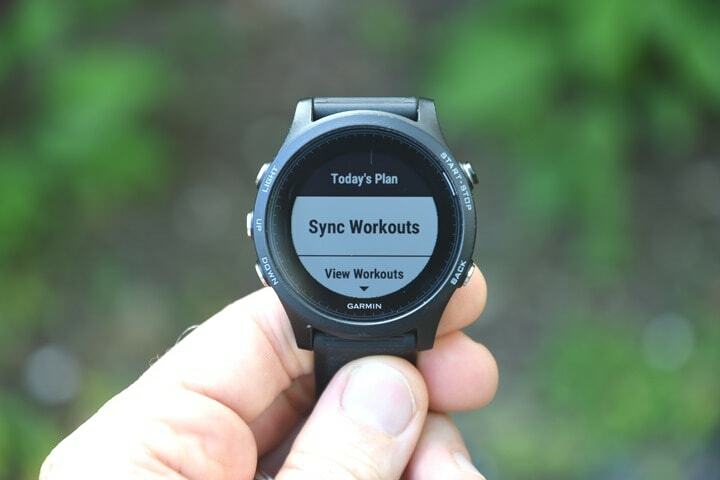 To me the best part about using a training plan is I can sync it to my Garmin, start my run/cycle/swim, view my workout and then complete it (while receiving prompts to slow down, speed up, etc.). I can create a swim workout and it will transfer but none of the swim workouts on training plans work. In general I feel like training plans are quite neglected on most devices and there is so much room for improvement. I’m going to give Today’s Plan a try, fingers crossed. The training plan’s are my electronic coach and I would love to see DCR expand on how well training plans are implemented on each device. There truly isn’t a lot of info out there concerning their implementation. Makes me curious as to whether training plans are so poorly implemented because they are just not used by a majority of the consumers or whether they are not used because they are so poorly implemented. Please let us know how you go (support@todaysplan.com.au) with trialling Today’s Plan as we are curious to hear your feedback on the new platform. I wonder if you can upload directly from Trainer Road, Zwift or Sufferfest. Yes from Zwift, no for TrainerRoad, not sure on Sufferfest. No but its quite easy to get it into TrainerRoad. 2. In Today’s Plan there is a download file button (looks like an arrow pointed up) in the top bar. 3. 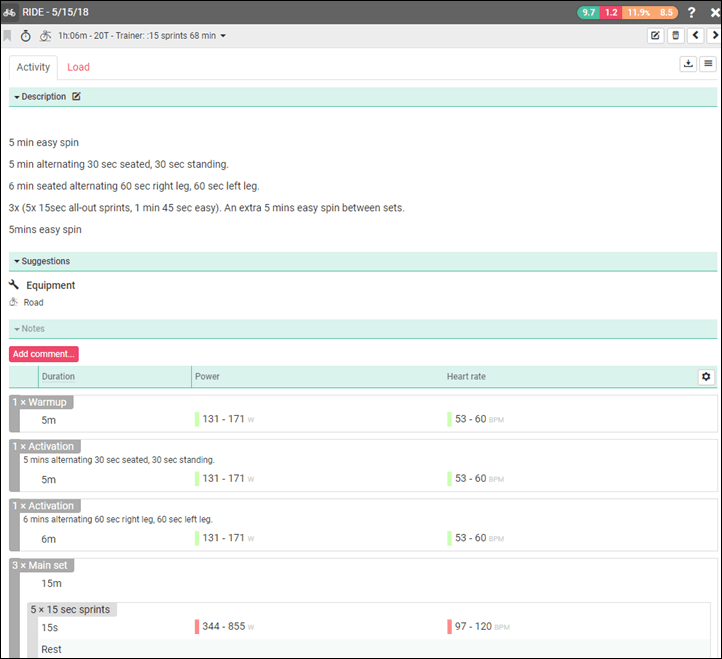 Drag and drop – this includes any comments that you put into Trainer Road. You can also export out the training program files straight into TrainerRoad with their workout maker. Just as a side note the workout files download to your Wahoo Element as well for the on the road stuff. Interesting, will have to check it out. One of my biggest gripes about TP (and Garmin Connect) has been that it looks like Windows 95. 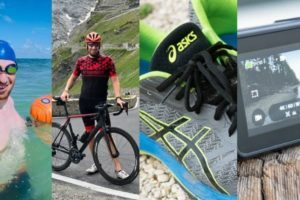 I simply didn’t use because of just that and stuck with more friendly platforms like Strava. I know they’ve upgraded TP slightly, but the user interface still is lacking compared to others. 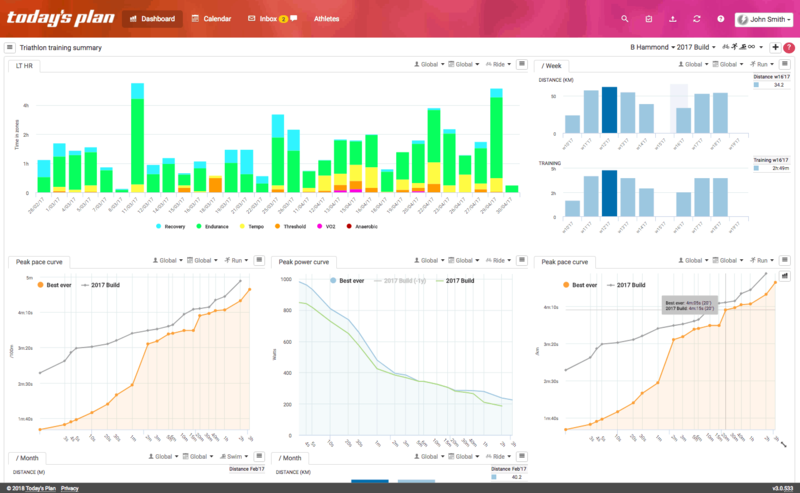 Final Surge seems to be a more pleasant UI to use but not sure how well it compares for data analysis. This one seems to sit somewhere in between perhaps? 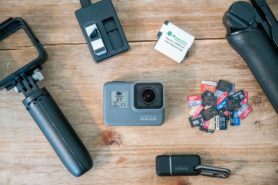 When you review apps/devices that have a Connect IQ component to them, would you be able to mention if it’s v1 compatible, or v2 only? As a Fenix3 owner, I’m often excited about a new app or data field, only to be disappointed that it’s v2 compatible only. Great work as always, thanks. Just wanna point out what looks like a typo. Last sentence of second to last paragraph reads “… training log platforms are without the most complex entity…”. I think you meant to say “without *doubt* the most complex entity…” ? I tried Today’s plan for a while, but found a number of issues which after discussion, it was clear was not on there agenda. 1. Creating structured workouts was complex and unintuitive. It’s obvious they want you to spend the money and use there’s. 2. Uploading workouts from Training Peaks is not supported. Again pay the money and use there’s. 3. User interface is cluttered and requires a sizeable screen to view all metrics. 4. 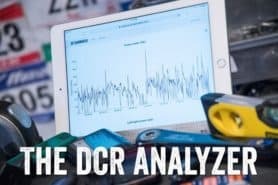 Really only caters for the ‘very’ serious athlete who requires exhaustive analysis and so therefore doesn’t give you metrics that are useful for the weekend crit racer – SKCC. This looks interesting. I’m going to dive deeper into it next week when I get to a computer and give the trial ago. 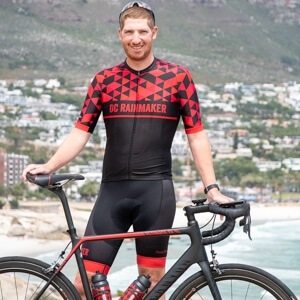 I’m particularly interested in the training plan part given I’m planning on my first 70.3 (and first tri) next year and it’s intergration with my FR935. Some years ago I thought to write my own planning tool, where I can plan my workouts, record body metrics, etc. Now I am using Today’s Plan more than 6 months. And I really happy with that. Calendar, everyday body metrics, wellness, training plans this is everything what I wanted. There is couple bugs in UI and in business logic, but support team very works very well. Very responsive and fast. I just signed up for a year of Today’s Plan with their shift to multi sport as there is a lot to like about it but I have been banging my head against a wall trying to create my own structured workouts. I am sure it must be possible. If I could get my head around that aspect I would probably be ready to stick and abandon Training Peaks, until of course XERT becomes multi sport at which point …. It becomes obvious that they’d rather you paid the extra and use theres. We do have the ability to create your own structured workouts for a range of sports. 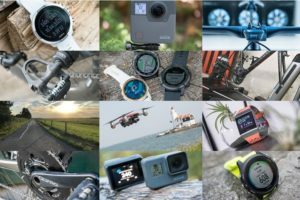 These are generally all compatible with your devices (Garmin, Stages, Wahoo, Lezyne etc) as well as the online platforms (Zwift, FulGaz, TrainerRoad etc). With our implementation of swim and run, you’ll be able to follow your run workouts on Zwift. 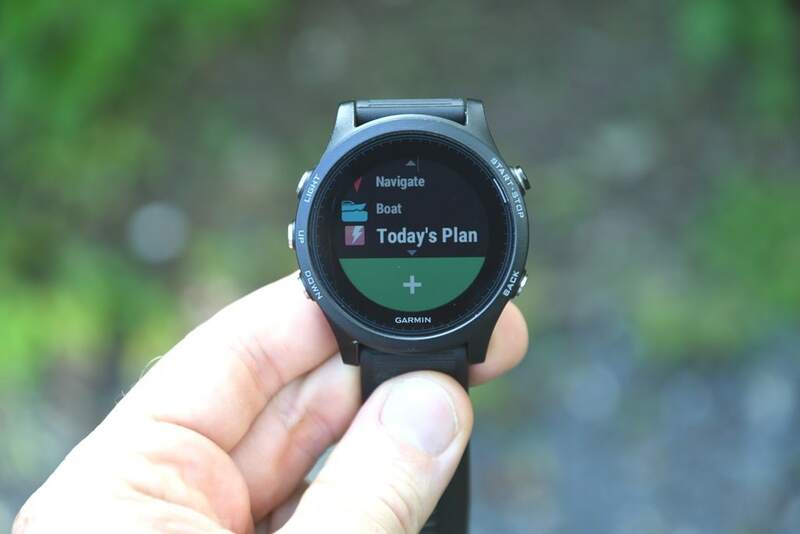 Either using our desktop agent or Connect IQ app, you’ll also be able to follow both your runs and swims on compatible Garmin devices. 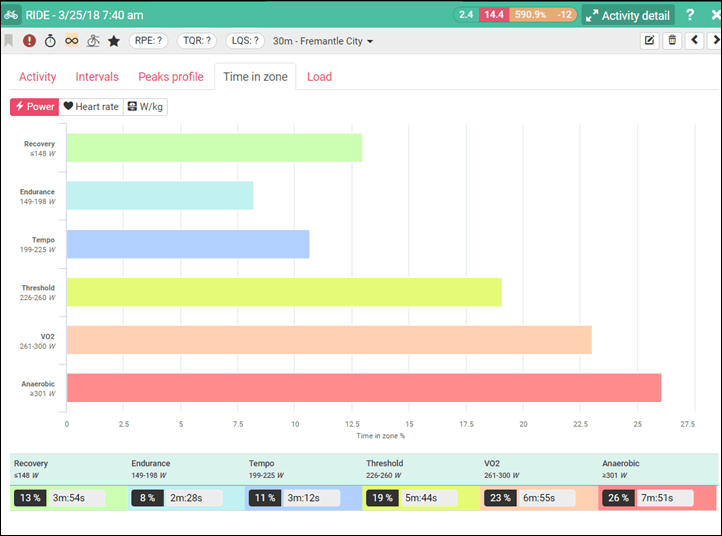 With our structured workouts we’ve removed a lot of the traditional limitations as well and allow you to create them via a combination of both distance and duration, you can set specific paces or zones, create workouts with built in progressive overload that can be applied to subsequent weeks in your calendar and if so inclined you can also prescribe intervals based on set repetition cycles. If you’ve got any specific questions on building your structured workouts feel free to send them through to our support desk (support@todaysplan.com.au). As Tom has also kindly pointed out we do have a library of workouts we’ve created as well (probably around 2000+ workouts). I will point out that these are included in the cost of a Today’s Plan subscription and you’re also able to clone any of ours and then adapt them, edit them or change them completely. All of which is definitely at no extra cost. OK so I have now found the stock workouts and how to create your own. The capability is certainly very flexible and it is nice to see that it covers different sports. The only area it falls short is the lack of visualisation which is common on all other platforms. A workout graph would help ensure that the steps entered reflect what was intended in terms of effect. On your point about gradients on the elevation graph… I’ve always thought that a graph showing gradient would be far more useful than one showing elevation. Sure, elevation is interesting and fairly intuitive, but it is gradient I care about. And more than just colour coding an elevation graph, but a graph showing % gradient by distance (would be really handy to see that you have several ramps >15% in a ride, for example. Especially if you are the kind of person who might want to change their gearing for such a ride). I am not aware of any of the route planning / ride analytics packages having this… Am I really the only person who thinks this would be useful? Veloviewer will tell you this for routes. Is it just me, or have they flip-flopped the symbols for minutes (‘) and seconds (“)? I responded to your support ticket but thought I would leave this comment here to keep others in the loop. We have raised this with Lezyne as it looks to be related to a change they made on their iOS app. They are looking into this as we speak and it still works on Android, and given their usual fast response rate I expect there will be a fix shortly. Is it just me or is Today’s Plan a bit slow? (desktop mode) My laptop is 4GB RAM and 1GHz Quad-core and is alright on most other websites. But Today’s Plan is a bit cumbersome to use because of the brief waiting/loading times.